Apple shares closed down 4.32 percent today, keeping with a trend started during after-hours trading yesterday. The real question: Could matters have been much worse, if not for the big carrot that came with the little stick? Apple missed fiscal Q3 Wall Street analyst consensus for revenue and income, but announced a big dividend and promise of more to follow. Performance was by no means bad, just not as good as forecast and the dividend, $2.65 per share, is something for shareholders to smile about. But behind the magic, I have to ask: Is Apple distracting shareholders and Wall Street analysts, making them look over there so they miss the trick going on over here? It's a question I can't answer but can only speculate about. Another quarter of results will reveal much. One thing is certain now: iPhone sales are slowing. There's no if about it, but why. Are people waiting for the new model or are Android rivals like Samsung pulling away more buyers? Analyst consensus for the quarter was around 29 million iPhones. Apple shipped 26 million, up 28 percent year over year but down 26 percent sequentially. Revenue declined 28 percent quarter-on-quarter. This is by no means the first sequential decline, but it's unusually severe, and the Street already expected as much as 19 percent Q2 to Q3. During yesterday's earnings conference call, Apple CFO Peter Oppenheimer gave a simple explanation: "Our weekly iPhone sales continue to be impacted by rumors and speculation regarding new products", adding later: "Regarding iPhone, we’re reading the same rumors and speculation that you are about the new iPhone, and we think this has caused some pause in customers purchasing". There you have it, iPhone 5 rumors. But if that's true now, why not a year ago? Fiscal third quarter 2011 led into release of iPhone 4S -- and lots of rumors about it -- and there was longer time between new models, meaning more pent-up demand. Yet iPhone shipments grew 183 percent year over year and 9 percent sequentially then. Something else: As distribution increases so should sales. At the end of the fiscal third quarter, Apple distributed iPhone through 250 carriers in 100 countries, up from 230 carriers in 100 countries the previous quarter and 186 carriers in 90 countries a year earlier (Q2 2011). Looked at differently, in Q3 2011, Apple shipped 20 million iPhones through 228 carriers and 26 million through 250 carriers a year later. But sequentially sales fell from 35 million, even as Apple added 20 carriers quarter on quarter. iPhone's introduction in China helped lift second-quarter iPhone shipments but fell off dramatically during Q3. Apple generated a stunning $7.9 billion revenue in China during Q2 but only $5.7 billion three months later. "Virtually all of the $2.2 billion sequential revenue decline was due to the iPhone sales in Greater China and about half of that $2.2 billion is attributable to changes in the channel inventory", Apple CEO Tim Cook told financial analysts yesterday. As a reminder in the previous quarter in our fiscal Q2, we launched the iPhone 4S in China, in January, we added China Telecom as the second carrier in March, and as we proceed across the quarter we increased the channel inventory to accommodate sales, and to reach our target inventory of four weeks to six weeks. The remainder of the sequential revenue decline is mainly attributable to the normal seasonality after the very successful iPhone 4S launch. Shouldn't sales continue to grow with addition of a new carrier and sustain or even increase three months or more later? If you look at other geographies, the pattern is more like this: Sales grow for at least several quarters after opening up new markets or channels of distribution. What's really going on in China? Is the top line of potential buyers who can afford iPhone already tapped out? I don't have an answer today. Some people will argue that smartphone adoption is slowing, at least in mature markets, as reason for iPhone's sequential declines. Using the United States as sample, that's not the case. Sequential iPhone activations dropped by 14 percent at AT&T. Verizon reports actual sales -- 2.7 million, down 15.6 percent quarter on quarter. AT&T's number isn't as reliable since activations don't necessarily mean new sales. It's common for people to sell or hand down an existing iPhone when replacing it. Last I checked, these count as activations, too. This in some ways explains the gulf between the carriers -- iPhone accounts for about 73 percent of AT&T smartphone activations and 45 percent of Verizon smartphone sales. So looking solely at Verizon, iPhone sales surged following release of iPhone 4S last year, but the overall number compared to all smartphones has consistently dropped since: 55 percent in Q1, 50 percent in Q2 and 45 percent in Q3 -- all while overall smartphone sales increased and Verizon added new 4G LTE models running Android. The broader market is more revealing. Today, comScore released a fresh take on smartphone subscriber data for the three months ending in April. For starters, the smartphone market continues to grow gangbusters in the United States, with more feature phone owners moving up than ever. 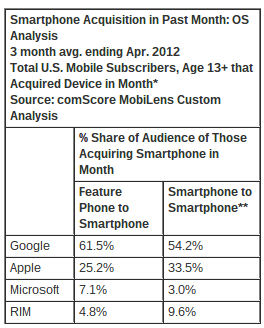 A year earlier, 38 percent of feature phone buyers bought a smartphone as their next handset; 47.5 percent in April 2012. More telling: Which smartphone platform they choose. There's popular folklore spread by the Apple Fan Club of bloggers and journalists that Android users largely switch to iPhone. comScore's data disputes this: 54.2 percent of smartphone to smartphone buyers choose Android versus 33.5 percent for iPhone/iOS. The percentage going from feature phone to smartphone is greater: 61.5 percent Android compared to 25.2 percent for iPhone/iOS. The analyst firm doesn't reveal percentage based on starting platform, meaning how many Android smartphone owners go to iPhone or visa versa, just the destination. That's revealing enough. The smartphone market is fast-changing and volatile. Much can change in three months or six. But, today, iPhone sales are slowing. Year-on-year growth is down compared to previous quarters and years, while sequential growth is way down in Apple's fiscal Q3. Perhaps some people hold out for iPhone 5. Perhaps many others don't see iPhone 3GS, 4 or 4S as compelling, with their 3.5-inch screens and no 4G LTE. Consider this: The majority of new Androids sold right now run an older version of the operating system, while iPhones the newest iOS -- and still the Googles sell better. That says much about consumer priories, which is probably best for another post.